This charge out rate calculator will help a business calculate the hourly rate it should charge customers for its services, for example consulting rates or IT contractor rates. The hourly charge out rate calculated takes into account what the business needs to charge to recover its costs, including the owners salary, and to make a profit, allowing for non-productive, non chargeable hours. The calculated rate can be used as the starting point for a revenue projection to be included in the financial projections template as part of a business plan. The available hours are calculated. Enter details of the number of available weeks in a year, days in a week, and hours in a day. The charge our rate calculator calculates the total available hours in a year. The non working days are entered. Enter the number of non working days to allow for holidays, sick leave, and other matters. The hourly rate calculator calculates the total working hours available. The non chargeable hours are entered. Enter the number of hours in each working week that are spent on non chargeable matters such as administration, and marketing. The charge out rate calculator excludes non working days from this calculation, and calculates the number of chargeable hours available in a year. The details relating to salaries are entered. Enter the salary required by the owner of the business (this is in addition to any profit made by the business), other salaries paid to employees, and a percentage markup to allow for taxes and benefits relating to salaries. The details relating to costs are entered. Enter the total value for all operating costs of the business. This will include such things as rent, utilities, telephone, vehicle expenses. If an analysis of operating expenses is required, our business overhead calculator can be used to provide this. Material costs are normally excluded in the calculation of a charge out rate. For a service business which includes materials being supplied to customers, it is normal to add these to the final account on a cost plus markup basis together with an hourly rate for labor. The markup on costs. Enter a markup on costs percentage to provide for any profit required by the business. This profit is in addition to the owners salary previously entered. 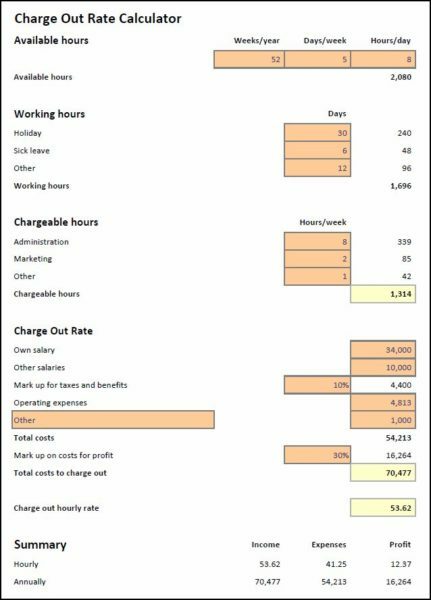 The charge out rate calculator calculates the total costs, and the hourly charge out rate, and produces a summary of revenue, expenses, and profit on an hourly, and annual basis. The charge out rate spreadsheet is available for download in Excel format by following the link below. Users use this charge out rate calculator at their own risk. We make no warranty or representation as to its accuracy and we are covered by the terms of our legal disclaimer, which you are deemed to have read. This is an example of an hourly billing rate tool that you might use. It is purely illustrative. This is not intended to reflect general standards or targets for any particular company or sector. If you do spot a mistake in the charge out hourly rate calculator, please let us know and we will try to fix it.